The title of this post is a line that might be known to people as it was used in the movie, Return of the King. The line does come from the great work by author J.R.R. Tolkien, The Lord of the Rings but the movie uses the line in a different context than the book. In the movie, the character of the elf-lord Elrond speaks this line to the man Aragorn when he hands over the great sword of the King of Men. In the book, this line appears in the appendix (The Lord of the Rings has numerous and exstensive appendices) and is spoken by Aragorn’s mother shortly after the birth and naming of Aragorn. Why the nerdy literature lesson? Because this line has great meaning to me and I wanted to explain before I explain why. You see in the movie the line is spoken by Elrond, a king who has power in the world and who has sons and a daughter and lands. He speaks it to the grown Aragorn who will become a king and marry and have children and power and lands. You see, these characters have hope in the world and beyond it. This is a distortion of the original use. Aragorn’s mother is a widow, her husband having been killed in a battle with orcs. She knows her son is the rightful heir to the kingdom of men but also know that she will not see that come to pass. All she knows, all she rightly knows, is the passing nature of the world around her. She names her son Estel, which in Tolkien’s world means ‘hope.’ At the birth and naming of Estel/Aragorn she says, ‘I give hope to men, I leave none for myself.’ She dies not seeing her son come into his glory. A lengthy introduction to what this post is really about – the priestly life. The experience and the knowledge that come from it happened two weeks before I wrote this post. 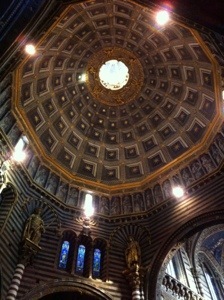 I had been 10 days in Siena and nearly three weeks in Rome. Some friends had had babies, got pregnant, got new jobs, started new things, had hurts and troubles – and I was some thousands of miles away. All things familiar were beyond reach and Skype (which is amazing) just isn’t quite the same. In Rome the house was empty, the other priests don’t return until mid-September and by the time I arrived in Siena the seminarians had left and I was surrounded by German college girls and middle-aged French women who were all atheists. There was a lot of apostolate but things familiar and friendly were far away and hard to see. It seemed like my kingdom was out there, a home that I had built, somewhere out in the mists, but I couldn’t get there. It had been taken away from me and there was no way back, in fact it wasn’t even mine anymore. I was lost, alone, adrift, somewhere and yet nowhere. This was surely emotion, I won’t deny that, but much more than mere emotion. You see, I wasn’t sad. It was easy to have joy at the Mass, to smile and chat with the teachers and other students, to enjoy the cool breeze and the warm pasta and the amazing Tuscan landscape. But it wasn’t mine, none of it was mine, none of it could ever be mine – it wasn’t home, it never was home, it could never be home – none of it ever was or would be or could be. “Lord, we have left everything to follow you, what will there be for us?” Houses and children and lands, says our Lord Jesus, with persecutions and eternal life in the world to come. Surely I trust this promise but on one warm Monday morning it seemed like a fading icon as I made my way to the Cathedral in the center of Siena. During the daytime it is packed with rather noisy tourists but in the morning (7:30 am) it is empty and fairly silent and the Madonna chapel (built by the famous Bernini) has the Blessed Sacrament reserved. There I went, as I have very weekday morning, to do my mental prayer and pour out my heart to God. To be brief about it, my time of prayer was deep and powerful and gave rise to true grief in my heart a sort of ‘blessed are those who mourn’ opportunity – and I took it. This mourning was far from perfect but was deeply consoling as I saw how much attachment I had to shed from my soul to be what I truly am, a priest of Jesus Christ, without house or lineage. The Christian priesthood is not hereditary, it does not descend from father to son, save for God the Father and His Son, Jesus Christ. It does not belong to any house or family save the House of The Lord. Priests are not nobility nor royalty save the Kingdom of God and well, ‘My Kingdom is not of this world, if it were of this world. . .” If you know the Bible, you know how the rest goes. When I left the chapel I went out a looked up at the great inner dome of the Cathedral, ringed by saints and decorated all in blue with gold stars running up to the center and top where there is an image of the Holy Spirit. Heaven is my only hope. You say, Father, heaven is everyone’s only hope. That is true enough, but not the same for others. You see, others will find spouses, have children, buy homes and property, they will build careers, found companies they will have a lineage that carries their name. True, ‘not one stone will be left upon another’ but most people and many Christians have many hopes in this world. And they should! The world is not a bad place, it should not be loathed or despised and Christians should build hopes in this world. It can be hard to have hope in this world. So much goes wrong, so many dreams fail, promised falter, lies prevail, greed triumphs, evils are perpetrated again and again and again. There must be those who can give this unattached, un-fettered hope, who can give hope to men and leave none for themselves. This is a good life I have been given but such a strange one. I love this world and all the good things in it but know that none of them are mine and all of them will pass away. Thus, I give hope to men, I leave none for myself. I have no home in this world, I will leave no line or name behind me, my few and paltry treasures will fade so quickly when I am gone from this life. All I have to give is hope: the true faith, the sacraments, the charity of God. All of this is yours, O priest of Jesus Christ! It is an immeasurable treasure, the weight of glory, a pearl of great price and it cannot be obtained in this vale of tears. Every priest, true to his vocation, laughs with some one moment and cries with someone else the next. He appreciates all of the beauty of this world only because he knows it will fade into something more beautiful. He is always joyful, not because of the good things of this world but because of his knowledge of eternity. There is nothing here for him save the passing love of friends that is only confirmed in the eternal love of his Lord. There is so much good in this world and none of it is for me. I give hope to men, I leave none for myself.